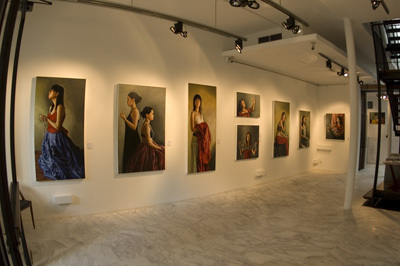 Parables, a series of paintings derived from life painting sessions, involve the interpretation of religious parables by the sitter and artist. Frozen in moments of contemplative gesture, they are pious tributes to God, and a religion that has shaped the Western Art world through its patronage. One may choose to see that link, or see the paintings formalistically, as accomplished works possessing harmony in colours, balance in composition , rhythm in poses and a proportion close to life size. Artists since the Medieval period has became distinct from anonymous craftsman, and the earliest records of art history, as written by Giorgio Vasari in “Lives of the Artists” had indicated intrinsic relationship between churches and commissions, determining to some extent what artists created. This series seems to be the anti-thesis of Bill Viola’s The Passion series, not in context, but media and presentation. Viola’s plasma TV screens are literally moving paintings, recorded high definition slow motion videos of contemporary folk/actors in the poses of religious paintings of the 15th and 16th century. What is similar is the sense of silence, reverence, isolated and staged acting/posing. The intensity, exaggeration of emotions seen on faces and bodily action, is perhaps more pronounced in Bill Viola’s work then Namiko Chan’s. The paintings could be rather cryptic if you are as unfamiliar with parables as I am. Some, with a little research on the web could be rather controversial. Not chosen because of their messages, but more for their composition are two for comparison. 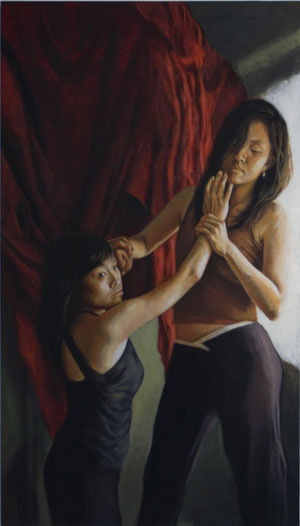 The painting depicts two women tussling over something, with one standing over the other. The two figures are possibly arguing over something. The colours are sombre, but shadowed by a deep and intense red, and a window of white light from the right. Their expressions are confusing, or non-chalant as those usually depicted in Paula Rego’s paintings. The rudimentary unpicking of the phrase might hint that the stone is a metaphor for something that was previously rejected but now has become a topic for discussion again, hence a keystone in a foundation/structure of some sort. Is the structure referring to the structure/hierarchy of an organisation, religion or family? A more contemporary interpretation of the phrase might suggest initiatives and concerns undertaken to bring our definitions of ‘marriage and family more closely in line with how we actually live’, addressing or non-addressing issues of same-gender relationships. 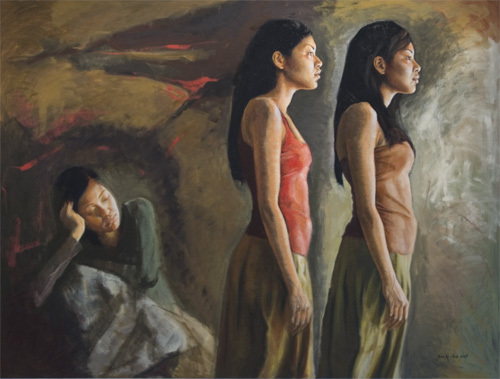 This painting features three women, two standing and staring into the distant right, and a woman resting with her right arm on her temples, left hand folded and leaning against a rock. The women standing have well chiseled physique, resembling sisters. They are almost emotionless, slightly hunched but not overcomed. They see something that we don’t. The figure sleeping or resting is oblivious and seems peaceful. The colours are muted, in a distinctly abstract Ochre background. The painting’s title is suggestively apocalyptic, or suggestive of the second coming of God. There are multiple possible readings of the work. The ‘three’ women could be the same, waking youth, proud woman, and as she ages and walks towards the light, or eminent death. The three women could be the beginning of the artist’s exploration of the symbolic ‘3’, not unlike Jim Carey’s character Walter Sparrow in the movie Number 23 directed by Joel Schumacher. “Religion is filled with descriptions involving threes. The Father, Son and Holy Ghost are the trinity that make up God in the Christian Faith. Peter did forsake Jesus three times. After three days Chris rose from the dead…” (The book of Threes – Religion) . The ‘all female cast’ sitters of the paintings sheds some light on another feminist approach to consider the works. There are very few media prominent women in Western, male dominant religious orders. Are the paintings a reminder of the balance of equality between the sexes, or the often under0valued important role of women in any family? The notion of patronage is also worth raising here. The root word patron in late Middle English, from Old French, means ‘protector, advocate’. The concept of patron here is two way: the artist as patron of Christianity, in a generic sense rather than a specific faith group within Christianity; the buyers, possibly Christians as patrons of the artist because they believe and recognise the values of the paintings. 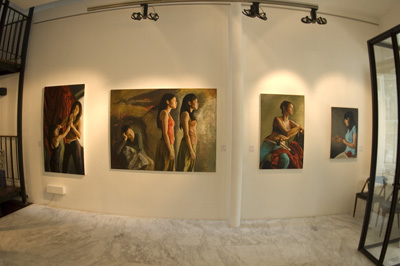 Either way, the artist has created a convincing body of work that is elegant, composed and enigmatic.